In the following clip, CNN anchor Kate Bolduan tears up while reporting on a heartbreaking photo from Aleppo, Syria. 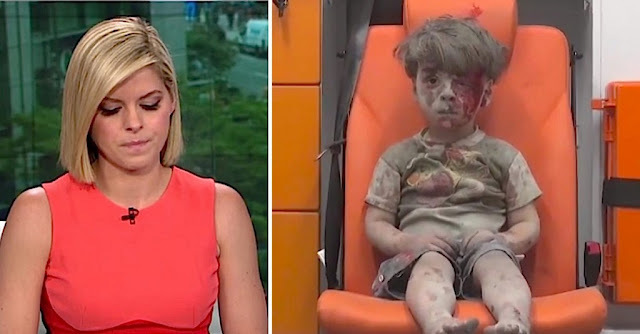 The image and footage of a little boy named Omran Daqneesh is going massively viral. It’s a haunting and disturbing representation of the current war in Syria. In the photo, Omran is covered in blood and dust, wearing a Nickelodeon T-shirt and silently waiting for medical attention. The image was captured after his home was destroyed by an airstrike on August 16, 2016. Omran lived in the Syrian city of Aleppo with his mother, father, brother and sister. Miraculously, everyone in his immediate family survived the bombing. In the live footage, Omran is seen wiping his face and looking down at the blood on his hand before a civil defense worker carries him into an ambulance. The Aleppo Media Center, where Omran was treated, said he was in extreme shock, hence his eery stillness and silence throughout the footage. After an hour of digging through the rubble, Omran was reportedly one of the first bombing victims pulled from the massive destruction. Compared to the injuries sustained by many of the other victims, doctors say Omran was one of the lucky ones. Thankfully, Omran has since been released from the hospital and is recovering, along with his family. His story is drawing cries for peace from people all over the world. This post was republished from littlethings.com. You can find the original post here.